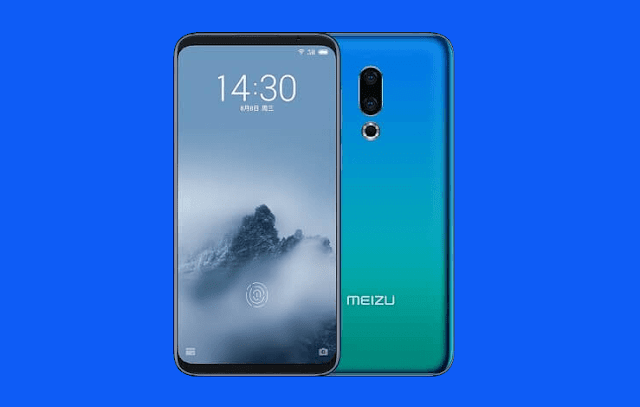 Meizu announced the arrival of its latest flagship smartphone in the Philippines – the Meizu 16. The Meizu 16 is one of the most interesting flagship smartphone right now with an affordable price tag. The handset has a gorgeous 4-curved surface 3D glass body with metal clad frame and pretty good overall specs and trendy features. The Meizu 16 features a large 6-inch notchless FHD+ Super AMOLED screen with symmetrical design. It is also one of the few with an In-Display fingerprint scanner. Meizu even used a 2nd generation optical fingerprint hardware. The Meizu 16 has no notch mounted on its Super AMOLED screen, resulting to 2160 x 1080 pixels with 18:9 aspect ratio. The Meizu 16 even has an in-display fingerprint scanner. The flagship smartphone runs on Android 8.0 Oreo with Flyme UI. Under the hood, the handset is loaded with a Snapdragon 845 chipset paired with Adreno 630 graphics coupled with 6GB of RAM and 64GB of internal storage. The Meizu 16 equipped it with a 3010mAh battery that supports fast charging and also supports water cooling technology. At the back, it has a dual-camera setup. You will find a 12MP + 20MP dual-camera sensor. For selfies, you will find a 20MP snapper. Meizu also boasts the mEngine touch for music link ringtone vibration, MIMO antenna technology, 4G LTE, GPS, A-GPS, and GLONASS. 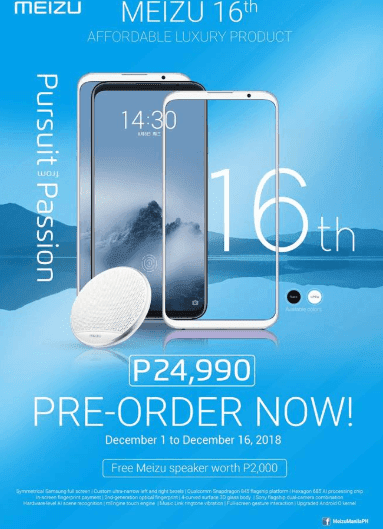 The Meizu 16 is priced at just Php24,990, and will be available for pre-order beginning December 1 to 16, 2018. Those who will pre-order will also get a free Meizu speaker worth Php2,000 available on SM Cybzerzones nationwide.